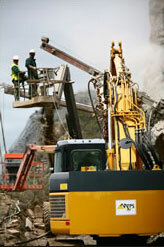 For half a century now, we have dealt with specialized works and their environment on a daily basis. We believe no construction site is quite like another, and each one is a new challenge to be met. Those challenges are what moves us on. The men and women at MTPS rely on the experience gathered over the years and on last-generation equipment that is targeted to their needs, and carry out the work with steadfast enthusiasm. If a particular work seems difficult, very difficult or maybe even imposssible to carry out, do not hesitate to consult us, and together we will find the solution that is best; there are always one or several ways out. At MTPS we are ready to intervene at any location within France. The Massif Central, Southwestern and Southern regions are areas that we know well since our work takes us there frequently. When required our teams may be seconded to missions abroad. activity with the MTPS structure.